France’s debt risk: CDS spreads or 10 year bond yields? i) Longer average maturities of British government bonds (gilts, we should say) – 13-14 years versus 7-10 years for France. This means that the French government has to raise more capital over a shorter period of time to pay its bills. 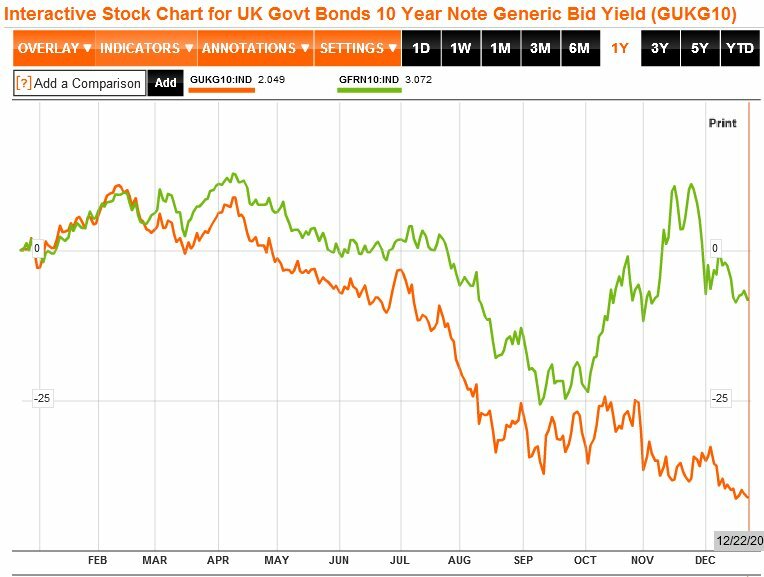 For these reasons and some others, the UK government currently (as at 22/12/2011) pays just over 1 % less for 10 year debt – 2.049% versus 3.072% – as per the chart from Bloomberg below. That’s bad enough. 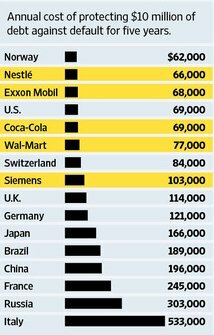 But yesterday I caught sight of a fascinating article in the WSJ, Super-Safe Assets Run Short Around Globe. As this table from the article shows, safety conscious investors appear to be putting a much higher premium on the cost of insuring French debt against default – more than two and a half times – than the UK’s over 5 years. In fact, the UK is even ahead of Germany. CDS spreads are not a perfect guide to the future of course. And I’m not sure about Switzerland being behind the USA. Still, they do give us a rather more complete picture that includes investor sentiment – and right now, that is looking far from reassuring. Which way for sterling next against the Euro and Dollar? As this chart shows, sterling has just gone through 18 months of value stability against the dollar and the euro. That’s actually quite a long time. With everything happening now in Euroland and the USA going up against the wire on lifting the debt ceiling, I just wonder if the pound might be due for a long-anticipated recovery? Italian and Spanish bond yields put Europe on tenterhooks . . . I don’t know how the final days of the Euro saga will pan out. The only thing I’m sure of is that it will be very ugly and it’s demise won’t do us Brits any good unless you have a formula for pricing in Schadenfreude. I’m also staggered by the decision of the ECB to raise interest rates a quarter of a point to 1.5%. So the big spike yesterday in the yield of Italian and Spanish bonds suggests to me that we are approaching the Euro endgame. Bailing out Greece is one thing. Supporting Spain and Italy would be an impossible other. If the yield goes to a fatal line of 7% according to Ambrose Evans-Pritchard in today’s DT, then it’s game over. 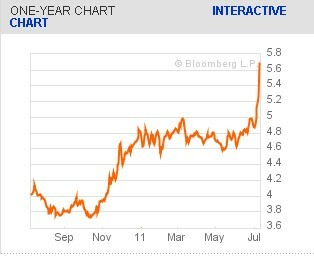 Below is a chart of the Italian 10 Year Bonds. Spain is worse – just over 6%. A couple of weeks ago, I was invited along with other youngish economics types by the excellent Centre for the Study of Financial Innovation to a dinner with a top financial journalist. 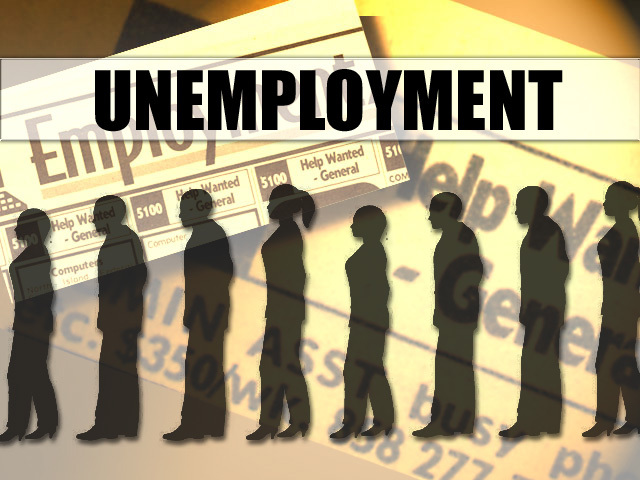 Macroeconomic forecasting is notoriously unreliable but I raised the question about why British unemployment (now 7.7%) hadn’t gone up anything like as much as anticipated with a 6% fall in GDP (about a million short according to Nadeem Walayat of Market Oracle) whereas US uemployment (now 9%) clearly had. What did this say about flexible labour markets in downturns when the UK’s was clearly less regulated in the early 90s? Is the breakup of the Euro fast approaching? 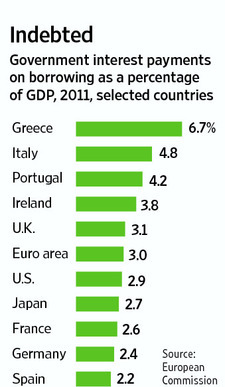 So Greece – particularly, Ireland and Portugal are all considerably worse. The UK has tentatively improved its position vis a vis Germany and Spain because of the sheer scale of the country compared to the other minnows, is one still to keep a close eye on. 1. The PIGS’ banking systems have not – so far – been able to repay their ECB borrowings. If the banking systems are eventually unable to repay the loans, the ECB will suffer a loss. 2. The ECB has already incurred losses on the bonds it bought in May, because of the adverse yield movements already noticed. These issues are bound to be raised by the five German professors who are testing the legality of the May support package for Greece at the German Constitutional Court. The losses that the ECB is now taking on its interventions to help the PIGS undoubtedly constitute a breach of the no bailout clause of the 1992 Maastricht Treaty. If words have any definite meaning, the German Constitutional Court must deem the ECB’s actions and the Greek rescue inconsistent with that treaty and therefore illegal. The Eurozone remains in great trouble.